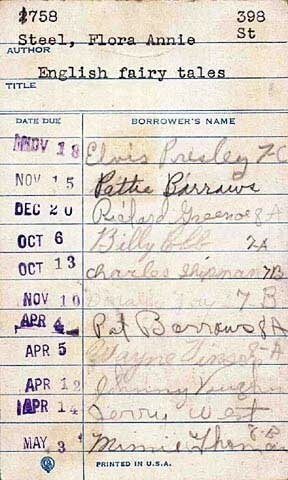 The 1948 library card with Elvis signature (see below) was found by a librarian while discarding old books, according to the paper. The current bid for the card, which is being sold with a copy of the book, is $2,600, and is expected to grow to at least $4,000 when the Heritage Auction closes on August 14, two days before the 35th anniversary of the singers death. 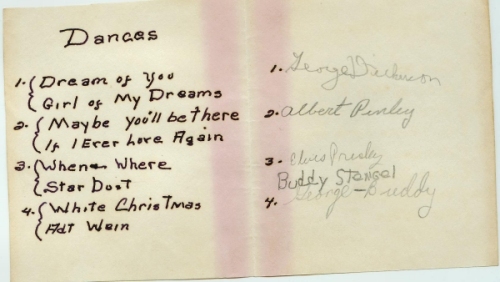 Elvis Presley Signature on Library Card: A signed library card was found by the librarian at the school Elvis attended in Tupelo and this is one of the earliest known signatures. Once the librarian realized Elvis fame, she searched through all of the books borrowed from the library by Elvis to find his signature. This example is accompanied by a letter from the Graceland Archives the archives has no full Elvis Presley signature pre-dating the one appearing on the offered library card. 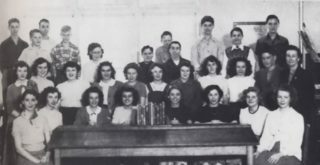 The astute Milam Junior High librarian noticed that one of the names on the checkout card  which every student had to sign when borrowing a book  was that of Elvis Presley! 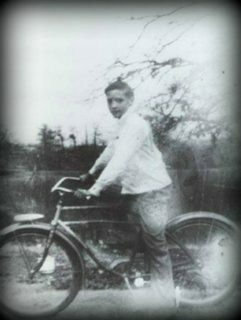 Written next to the name was the notation 7-C, signifying Elvis 7th grade homeroom class. A further search of the library unearthed another card with the singing stars signature. Obtaining permission from the school, the excited woman took the two cards home and put them in her scrapbook.